Myria Vassiliadou, the EU Anti-Trafficking Coordinator, has been in Belfast over the past couple of days. She was part of a think-tank with local NGOs yesterday, attended a dinner hosted by the Lord Mayor of Belfast last night, and then spent this morning with NI stakeholders. It was great to hear about and discuss the EU legislative framework and how it applies to NI, and I was honoured to be able to speak about the importance of awareness raising as a tool in combatting human trafficking. My thoughts are below – I’d love to hear yours, too! NI is fond of the word ‘wee’: this morning you probably had a ‘wee’ coffee, I searched for my ‘wee’ umbrella, and if you’re reading this in a seated position (if you’re standing, props to you! ), you may have taken a ‘wee’ seat. We are indeed small in size, so it’s apt that our favourite word is ‘wee’. But I believe that NI is growing in stature, integrity and progressiveness when it comes to how we approach human trafficking. It’s called STOP v MOP. The basic premise is this – when we MOP the traffik, we are supporting existing victims, dealing with existing perpetrators, nurturing our existing network. Those things are all vital. But if they are our only focus, we are simply freeing up spaces for traffickers to fill – and fill them, we know they will. So we have to duplicate our vision to also look at STOP. STOP means creating systemic change, involving ourselves in root causes, working on prevention. STOP could look like robust legislation that acts as a deterrent to would-be traffickers, or it could look like educating the vulnerable, or it could also mean addressing sexism, or racism. 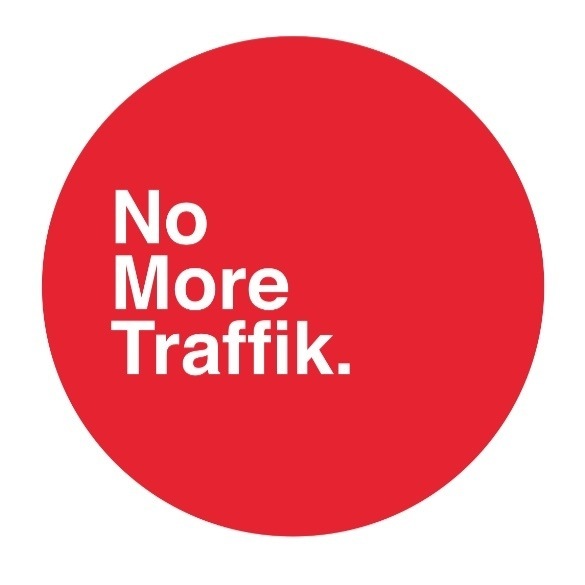 Two other ways we can STOP the traffik are through awareness and partnership. Awareness leads to action, and action leads to change. Everyone in Northern Irish society needs to know about the existence of human trafficking…because everyone has a role to play in stopping it. 1. Wide-reaching. We must be inclusive. We need to be having those awkward conversations that open new doors, to be present in as many pockets of society as possible. That is why No More Traffik involves itself in training new police recruits, border force staff, midwives, sexual health nurses, hotelliers, council staff (including postmen and binmen), pensioners, young people, parents, teachers, business people. 2. Creative. Traffickers are creative people. They are constantly finding new ways to exploit the people they see as commodities. They keep on top of things, and we must also do the same. So we must be creative in how we talk about human trafficking, and also in how we present it.We started with a flashmob. The GIFT Box was a new, attractive way to talk about human trafficking. One of our partners is renting a shop window next week to grab people’s attention. 3. Grounded. Awareness must be grounded in two things: truth, and action. Truth is vital. There is no need to sensationalise an issue so complex and dark. And we endanger potential and existing victims if we do. But it isn’t enough to present to people the problem of human trafficking – we must help them engage with the issue and make it their own. Action has to go hand-in-hand with awareness. So we make it our mission to provide ‘actions’ when we talk about trafficking – reporting the signs, buying certified products, volunteering time, influencing new spheres. We couldn’t point people in those directions were it not for the second way in which we can STOP the traffik that I want to highlight, and that is through partnership – allow me a short detour first. When talking about awareness, we can get a little bit vague. We need to be measuring it. Does awareness lead to action? If so, how? If not, why not? Two things that we have seen change are an increase in the number of reports of human trafficking from communities, and an increase in demand for certified products. Those are great indicators that awareness is working, and every new project must be examined on its potential to lead to behaviour change. Now. Partnership. No More Traffik sits on the DOJ’s NGO Engagement Group which is a network we have greatly benefited from. No one can afford to be precious or territorial in this: we have to work together for a greater impact. We also benefit from being a part of an EU member state, and visits like Dr Vassiliadou’s highlight this. And we look further afield to other jurisdictions we partner with as part of STOP THE TRAFFIK Global, knowing that shared best practice is an invaluable part of our learning. JRR Tolkien once wrote, “Little by little, one travels far”. (I like to imagine him translating that for his Northern Irish friend CS Lewis by saying “Wee bit by wee bit, one travels far”.) That is true – but what is also true is that little by little, one plus one plus one travel farther. 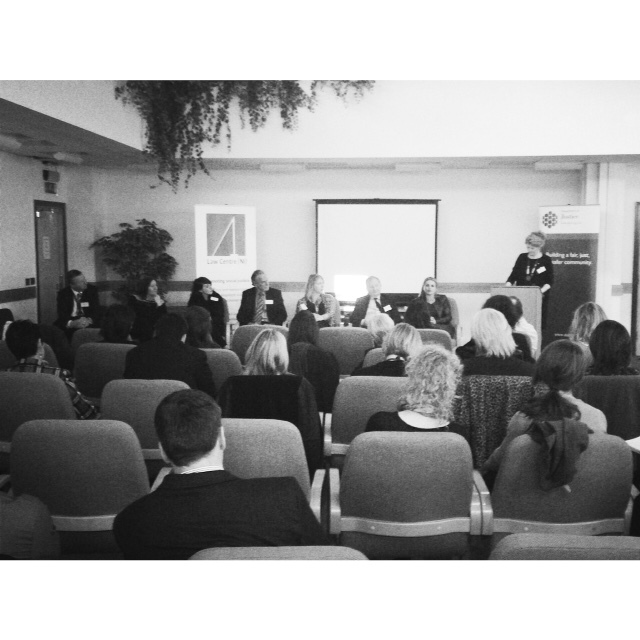 L-R: Noel Mullan (PSNI), Noelle Collins (Women’s Aid), me, Roger McVicker (Migrant Help), Julie Wilson (DOJ), Lord Morrow MLA, Myria Vassiliadou (EU Anti-Trafficking Coordinator) and Ursula O’Hare (Law Centre NI) on panel this morning. Great discussion with so many hard-working, forward-thinking partners.